From Banff to Lake Louise is about 40 mins driving on Highway 1. You can stop at the Lake Louise Village to buy gifts or eat something. They have shuttle buses between the village and the lake. The name was from Princess Louise Caroline Alberta who was the 4th daughter of Queen Victoria and wife of the governor-general of Canada John Campell in 1884. The first time we went to Lake Louise, the weather was really bad with freezing rain and snow. We hardly saw the mountains because the sky was so misty and foggy. We took some pictures and walk along the lake. Finally, we decided to go to Fairmont Chateau Lake Louise to eat something. The natural areas around the hotel were incorporated into Banff National Park, which has been declared a World Heritage Site by UNESCO. We sat by a window in the restaurant and enjoying our tea set. It was nice to see the weather changing. The snow lines on the mountains were moving down in 2 hours. The sky became clear and we took some more picture before we leave. It was a bit disappointed that we could not really see the reflections. Next day, we got a chance to stop by and visit the lake again. The weather was much better. We had blue sky with clouds and some sunlight too. So I took a walk to a gentle slope where I could set up my easel and paint. 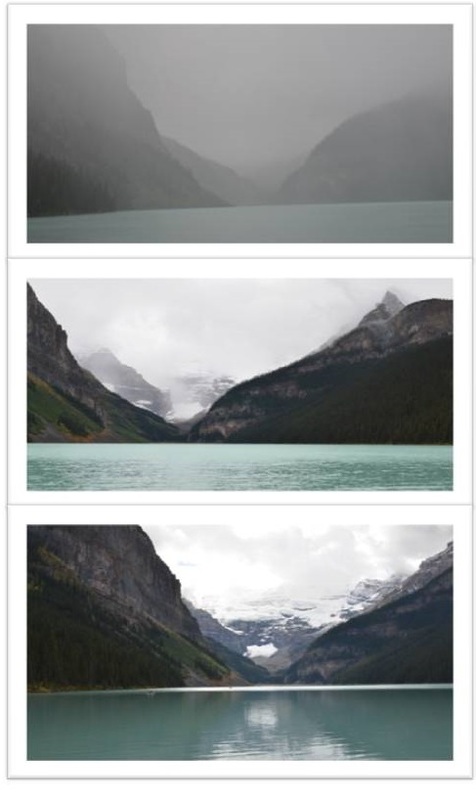 The colour of the water was different from those in Emerald Lake or Moraine Lake. Haven't said that, I think it was stunning too.